Once upon a time, it was thought that crop diseases affected only crops. However, new research in Journal of Ecology shows that a common wheat virus can spread and harm perennial native grasses. In their Journal of Ecology paper, researchers from Michigan State University, Kansas University and Virginia University show that farmers and scientists need to think about how best to protect native plants from diseases emanating from crops. The findings were based on a multi-year field study conducted in Kansas. There, like in much of the Midwest, plains of native grasses have been transformed to fields of wheat or other cereal crops. Now, it’s the patches of grasses that are the islands in an ocean of crops. A widespread wheat pathogen, barley yellow dwarf virus, can cross over and affect switchgrass, a prime candidate for biofuel research. 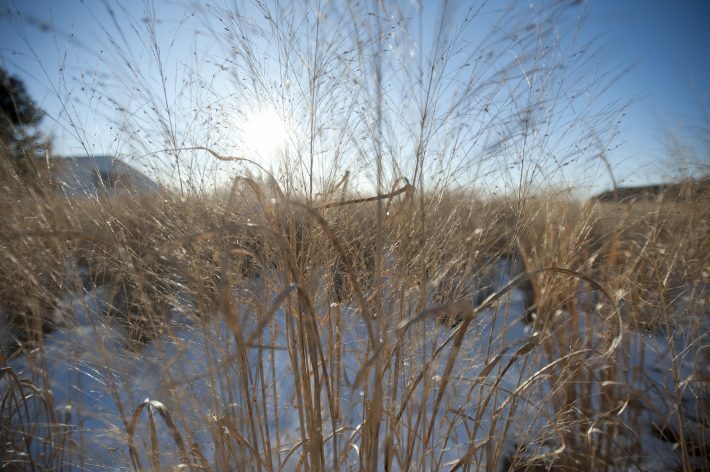 The research team combined the field results with a statistical model and showed that the virus can reduce the vitality of switchgrass by 30 percent. Interestingly, the infection can affect switchgrass’ growth even though the native plant displays hardly any, signs of sickness. While the study focused on merely one virus, it shows that science needs to catch up in understanding how crops influence native plants and to build more knowledge of virus ecology in general. The research team comprised Helen Alexander, KU, Emily Bruns, UVA, and Hayley Schebor, MSU. Malmstrom’s research is funded in part by MSU AgBioResearch and the USDA National Institute of Food and Agriculture. To find out more, read our Journal of Ecology article ‘Crop-associated virus infection in a native perennial grass: reduction in plant fitness and dynamic patterns of virus detection’. This article will be freely available for a limited time.